Description: This N.K. Brown’s Jamaica Ginger has approx. 80% of original label intact. Oval, smooth base, American C. 1870. This is a strongly embossed example. Nathaniel K. Brown was the successor to Fred Smith of Montpelier, Vermont. They produced Smith’s Anodyne Cough Drops with great success. 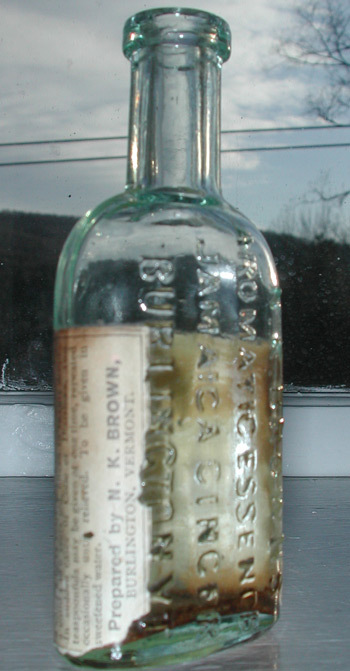 Nathaniel Brown also produced Brown’s Teething Cordial, Star Broches, Bronchial Elixir, Fluid Extract Buchu among.